You can’t take it with you, or can you? The Chinese emperor with the terra cotta army thought so. See for yourself in Age of Empires: Chinese Art of the Qin and Han Dynasties (221 B.C-A.D. 220), on view through July 16 at the Met. There are only a few horses and men from that monumental undertaking on display, but the terra cotta visitors are stunners. They and the other luxury and art objects on loan from 32 museums and archeological institutions in China provide a vivid look into the culture and pride of a people who were just forming an identity as a nation in 221 B.C. Previously, the Chinese continent consisted of warring ethnic tribes. Heavenly Han horse and military groom in bronze (25 – 220 A.D) from Mianyang City Museum. About a century earlier, classical Greek style, art, and ideas washed over Europe and Asia due to Alexander’s empire-building success. At the time of the Qin dynasty, when the Great Wall was being built, scholars wonder whether the Chinese emperors had seen (or heard about) large-scale classical Greek sculptures and asked their artists to out-do their Mediterranean counterparts. Why not build full armies, cities, entertainment troupes, cavalries, and watch towers and bury them in tombs of the emperors, princes, and princesses to serve them in the after life? Like the Egyptians, the Qin and Han emperors and princes wanted a lot of stuff to use in the afterlife. But unlike the Egyptian style, it was all about personality. Each large-scale sculpture is imbued with individual flair in their apparel, expressions, hairstyles, and weapons. If you listen to the audio guide, the curators tell us that the large-scale terra cotta armies were mass-produced using molds, but the artists were told to give each sculpture-person a dose of individuality before they were done. Terracotta cattle (206 B.C. – 9 A.D.) from the Yangling Mausoleum. That holds true for the animals in the show, too. The Han dynasty had a thing for beautiful, spirited horses and the center gallery in the show displays some beauties. Grooms come along, too. Apparently the conquering Han rulers kept menageries and ranches, as seen in the show’s room full of rhinos, elephants, cattle, pigs, and animals-turned-into-art-lamps. There’s a twinkle in each of their eyes, too. Another highlight is the jade suit made for a princess, which was supposed to form added protection in the afterlife. Another is the money tree. Who wouldn’t want one of those? The show’s objects reflect how many tribes and influences crossed paths over the course of the Han dynasty (think Silk Road) to create the modern view of a single, all-encompassing Chinese culture – diverse textiles, gems, inventions, and ideas. The final object, a bronze mirror from the Han dynasty, reflects it all – the first recorded inscription expressing the desire for the peoples of the “Central Kingdom” (a.k.a. China) prospering for generations to come. It’s the earliest inscription to reference many ethnic groups considering themselves as one people, one China. Take a look at all the objects in the collection on the Met’s site, or look at our favorites on Flickr. Exquisite detail and spiritual power are evident in every item showcased in the Metropolitan’s show, Native American Masterpieces from the Charles and Valerie Diker Collection, closing March 31. 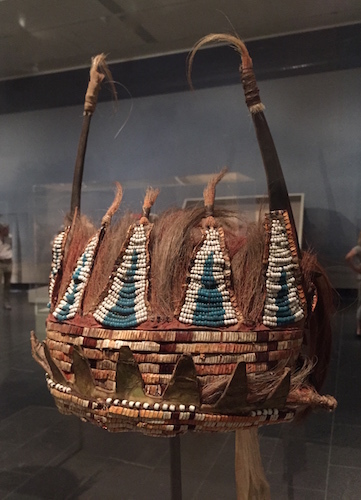 The Dikers have spent a lifetime collecting objects of incredible detail, spirit, and beauty and sharing truly dazzling works with the public, most recently in the Indigenous Beauty show which ends its national tour here in New York. 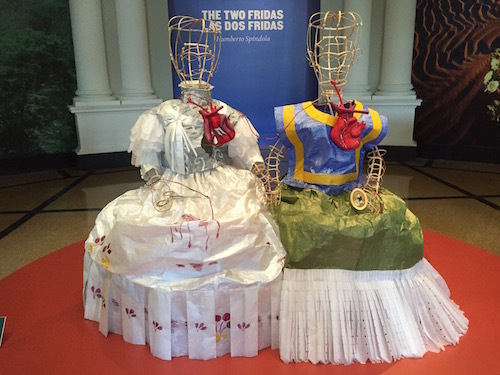 Every time we have visited the small showcase inside the Met’s African and Mesoamerican galleries, visitors have been pouring over every detail of the weave, beadwork, paint, inlay, and woodcarving on the masks, clay jars, baskets, shirts, coats, hats, headdresses, war shields, and hide canvases on display. Magical colors, geometric patterns, attached talismans, and even mysterious paint splotches pack powerful messages as animals, spirit-creatures, and half-human beings emerge in two and three dimensions. The majority of artwork and clothing dates from the 19th and early 20th centuries, but pieces are earlier, such as a nearly perfect Anasazi clay pot from 1100 A.D., which uses geometric 2-D wizardry on the curved surface to convey the interconnection of underground water reservoirs that enable agricultural communities to thrive in the Southwestern desert. The curators have taken care to cite the artists in cases where they are known, such as an1880s buffalo-hide shield painted by Joseph No Two Horns, a Lakota artist who participated in the 1876 Battle of the Little Bighorn. The show puts a spotlight on innovators, who began making monumental works for collectors, such as the large pottery jar by Nampeyo, the first well-known Hopi artist and Elizabeth Hickox, who became known for her three-dimensional embellishments in woven basketry in Northern California. Enjoy all of the details of our favorites from this show in our Flickr album. If you’d like an immersion into a chamber of glistening silver and gems, enter the National Museum of the American Indian’s exhibition of stunning beauty and tranquility — Glittering World: Navajo Jewelry of the Yazzie Family. The Smithsonian is providing New York with a unique chance to view 300 remarkable necklaces, bracelets, rings, and buckles from a New Mexico family of artists known for catapulting Navajo symbols, colors, and gems into a modern-art context. Lapis and gold bracelet by Lee Yazzie, 1984. Photo: E. Aboroso, NMAI. The focus is on Lee and Raymond Yazzi, brothers whose award-winning, intricate creations are sought by collectors worldwide. You’ll see five magnificent pieces as soon as you enter, including work by their sister, Mary Marie – representing lifetimes of master craftsmanship inspired by the mountains, sun, sky, spirits, and family in Gallup, New Mexico. Photomurals inside the door will transport you to the red rock monuments of Navajo Nation, 1950s trading posts along the old Route 66, and maps to turquoise mines that have supplied native peoples with high-end bedazzlers since 300 A.D. The Smithsonian will be returning it all to private collectors after January 10, so be sure to enter this beautiful realm before then. Tartigrades rule the show — the micro-animal survives high heat, high altitude, high pressure, without water, and even outer space. If you’ve ever wanted to take a magic carpet ride to visit all the animals, plants, and environments you’ve ever seen on National Geographic or Nova, spend some time inside the special exhibition Life at The Limits: Stories of Amazing Species, running through January 3 at the American Museum of Natural History. The curators and exhibition staff take you to the absolute limits of life on Earth in a “wow factor” show, organized into topics sure to astound. How high into the atmosphere do animals live? How deep in the ocean? Who is the world-record holder for bite force? Who makes the longest migratory journey? Who is the award-winner for survival in the extreme? The show will take you into deep caves, to life among the black smokers in ocean depths, to high altitudes, and even into outer space. And they’ve even thrown in some live creatures, too – the popular Axolotls, who retain their juvenile amphibious form into adulthood, and swimmers using the jet-propulsion method – chambered nautilis. Check out a few views on our Flickr feed. Not to give anything away, but you’ll find out that vultures have been known to fly at 37,000 feet and beaked whales have been known to dive at least 10,000 feet below the ocean’s surface. Crocodiles have a bit force of 3,700 pounds, electric eels and hammerheads can deliver 600 volts, and eagles can subdue animals of up 20 pounds in weight using only their claws. Arctic Terns may migrate 25,000 miles. There’s no doubt that the stars of the survivalist show are miniscule tartigrades (better known as “water bears” or “moss piglets”). These miniature eight-legged water creatures inhabit climates that no human could. They are able to survive at temperatures colder than Pluto and hotter than boiling water and have been known to survive in the void of space for up to 12 days. Moreover, tartigrades are prolific: nearly 1,200 species inhabit Earth in lichen, moss, beaches, and dunes and hold the distinction of residing at the International Space Station and being part of Space Shuttle Endeavor’s final flight. How did life evolve to adapt to such extremes? Darwin explains it in his theory of natural selection, which leads to gradual adaptations within animal populations. But you are left to wander and wonder at the engaging displays, animals, specimens, and movies. The Sinclair dinosaur was a sensation when he arrived in New York City to star in the 1964 World’s Fair. Millions of visitors queued to have their pictures taken with him and get a glimpse of life-size replicas of the scale and scope of the Mesozoic megafauna. T. Rex, Stegosaurus, Triceratops, Trachodon…never mind that they lived millions of years apart – just to see them inspired science geeks, wonder seekers, and future paleontologists – an unforgettable childhood impression. It may surprise you to learn that Sinclair and T. Rex are living a blissful retirement in Texas where there are no Unispheres, freeways, lines of tourists, or ticket booths…about 75 miles southwest of Fort Worth in a state park with another unique connection to New York. The gargantuan dinosaur trackway up on the fourth floor of the American Museum of Natural History is from the Paluxy River in Dinosaur Valley State Park, where these two former New Yorkers have retired. Back in the Thirties, AMNH field explorer Roland T. Bird told his boss, Barnum Brown, about the Texas trackways. In 1940, aided by WPA crews, the submerged tracks were excavated, cut into 1,200 pieces and shipped off to the AMNH, the Smithsonian, the University of Texas, and a few other places.The excavation was a media sensation, with chronicles appearing everywhere. In New York, the jigsaw-puzzle track pieces were eventually reassembled and placed under the Apatosaurus/Brontosaurus, where they remain today. The big, round blobby tracks that appear to match those of Apatosaurus are reckoned to be those of Sauroposeidon and the three-toed tracks running right alongside are those of Acrocanthosaurus, a predator. Even though this spectacular trackway got moved to New York, there are still plenty in in the park. There are at least five big sites, which have all been documented in the Dinosaur Valley State Park footprint-mapping project. See the results here. When you click on each photo mosaics or track overlays, they will open in Google Earth. Find the R.T. Bird site under Track Site Area 2. But how did the New York dinosaurs get to Glen Rose? The entire dinosaur group toured the United States for a few years after the Fair, right around the time that Texans lobbied to have the Paluxy Trackway declared a state park. No dinosaur fossils at the time, but there were lots of footprints, mostly underwater but a few on the shoreline. Neighboring ranchers donated the land, hoping to keep the site intact and spur tourism dollars. When the Sinclair tour concluded, Atlantic Richfield’s idea was to donate all the dinosaurs to the Smithsonian, but when the Smithsonian said they didn’t want the group, the band broke up. One went to Vernal, one to Cleveland, but Glen Rose was the only location that managed to get the two biggest stars. Did the New York connection make the difference? It’s hard to know, but the recently opened Perot Museum of Nature and Science features a pop culture corner in its dinosaur hall with replicas of all of the NYC’s World’s Fair dinosaurs! For the complete story, check out this video of the tracksite and an introduction to the Google Earth mapping project, old videos of Mr. Bird’s historic 1940s excavation, and cameos by the Sinclair dinosaur and friends. 1780 Horned headdress assembled from a powerful mix from mighty bison , deer, and horse. From Musée du quai Branly in Paris. With all the attention this week on the couture gowns at the Metropolitan Museum of Art ball and Costume Institute show, don’t forget that some of the most elaborately embellished mixed-media wearable art is installed on the second floor in the expansive tribute, The Plains Indians: Artists of Earth and Sky, through this weekend. The masterworks have been gathered from select European and North American collections and feature beadwork (mostly on leather), symbolic headdresses, and magical objects that directly telegraph the wearer’s connection to nature, the universe, and supernatural power. The show was organized by the Musée du quai Branly, Paris, in collaboration with The Met, and in partnership with The Nelson-Atkins Museum of Art, Kansas City, and features works from the 18th century through today (like the China exhibition in the other wing). 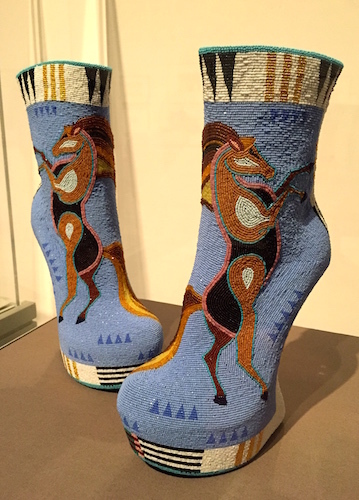 All-over beading on 2014 platform shoes by artist Jamie Okuma. The curators track changes in materials, styles, and concerns of the Osage, Quapaw, Omaha, Crow, Cheyenne, Arapaho, Lakota, Blackfeet, Pawnee, Kiowa, Comanche, and Meskwaki nations from the time they dominated the Midwest through the demise of the buffalo, the great wars, the transition to reservation life, and participation in 21st century art and culture. 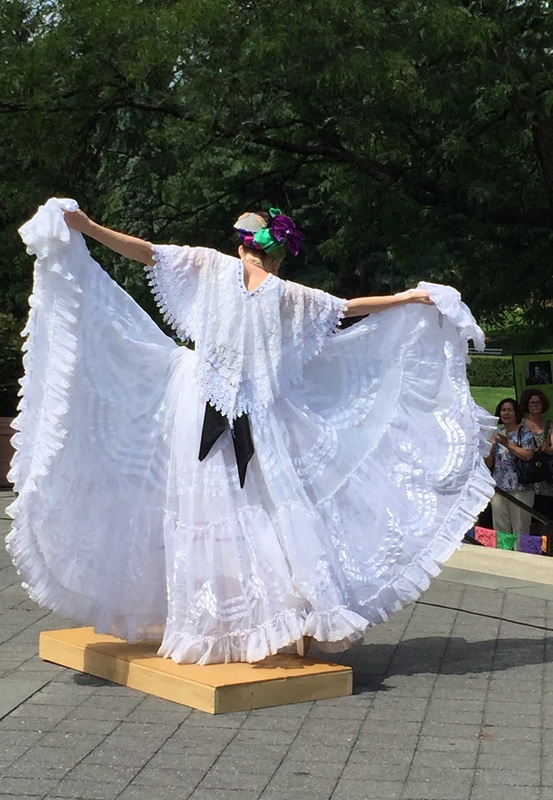 Take a read through the curators’ story on this exhibition site and see some of our favorite looks on our Flickr feed, where we’ve organized the pieces in chronological order. 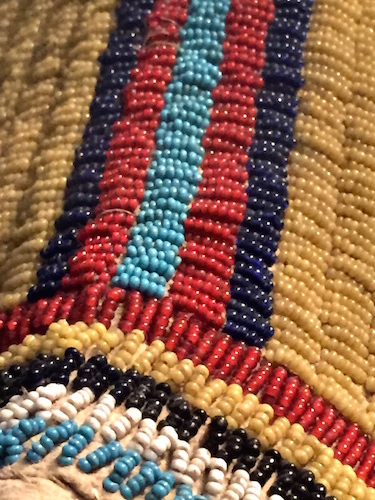 We’re giving you a close-up view of some of the bead, quill, and embroidery work. You can see the transition from more shamanistic embellishment to use of imported Venetian glass beads, to the all-over bead style, and finally to current creations, such as Jaime Okuma’s beaded platform shoes. 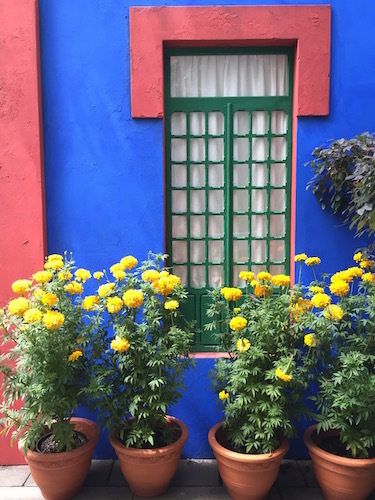 Much of the painting and handwork was divided according to gender – men painted figures and women did the beadwork and painted the geometric forms. 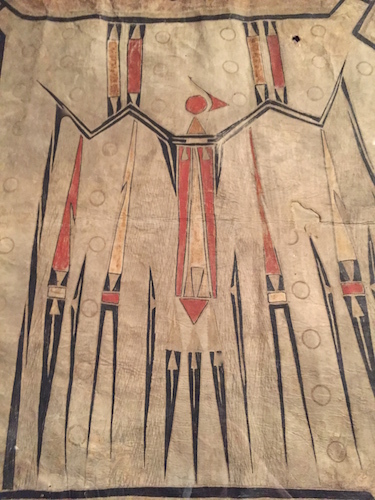 This beautiful robe with a geometric mythological bird is one of the earliest surviving large-scale paintings from Plains tribes, and the beaded geometry of the 1895 Crow wedding robe is another marvel. Compare the mixed-media horned headdresses from 1780s Missouri with Chief Red Cloud’s dramatic all-business trophy-feathered war bonnet of 1865. The fluffy-feathered 1925 creation from Cody’s Buffalo Bill Center almost makes you wonder if that version were strictly for wild west shows. It’s also interesting to learn that the powerful symbolic paintings on shirts and shields were essentially “owned” by their creators. Similar to what we learned about 1920s French couture designers’ concerns about unlicensed copies in FIT’s recent Faking It show, anyone wanting to replicate a particular war shirt or shield, had to be granted formal permission. The Met exhibition explains that replication permission of Plains Indian designs were closely held and protected for generations. A full database of the amazing objects in the show is on the Met’s website, as well as the complete audio guide to the exhibit on the museum’s Soundcloud site. As you click on the audio tracks, you’ll see a small thumbnail of the object. If you climb up to the second story of the New-York Historical Society to see Audubon’s birds, grab the magnifying glass right inside the gallery door. See the magnificent details painted by the watercolor master of all time in Audubon’s Aviary: The Final Flight (Part III of The Complete Flock), running through this weekend. 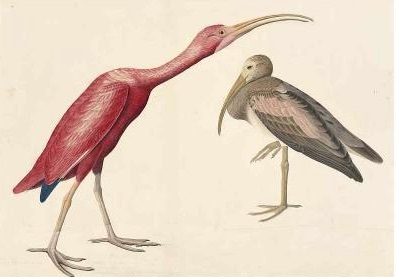 NYHS is the lucky owner of every watecolor JJA produced to make his historic Birds of America subscription project in the early 1800s, which documented over 700 species. The watercolor collection – from which engravings were made – is so large that NYHS had to split the exhibition into three parts. It’s a joy to look at the life-size paintings that Audubon produced through the magnifying lens, seeing the tiny brushstrokes on lush feathers and miniscule detail on the small hummingbirds. Paintings featured in all three shows are hung in the sequence that JJA painted them. Although JJA traveled extensively throughout the East and South, he never actually saw birds west of the Missouri in the wild. 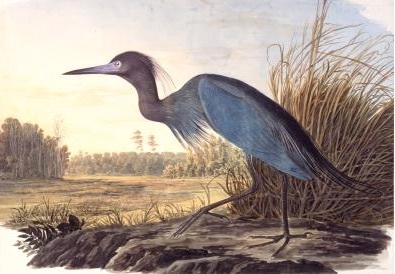 By the time Audubon began cranking out the watercolors needed for his final installment of his masterwork, lots of new birds were being discovered out West. Scrambling to keep up – after all, he committed to documenting every American bird – he accessed specimens collected by recent Western expeditions, Lewis & Clark’s trove, and other American specimens archived in Europe. 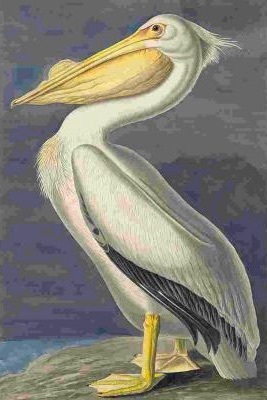 He holed up in Charleston, South Carolina in the winter of 1836 and worked, worked, worked to finish all the watercolors, which would be shipped to Mr. Havell in the UK for engraving. 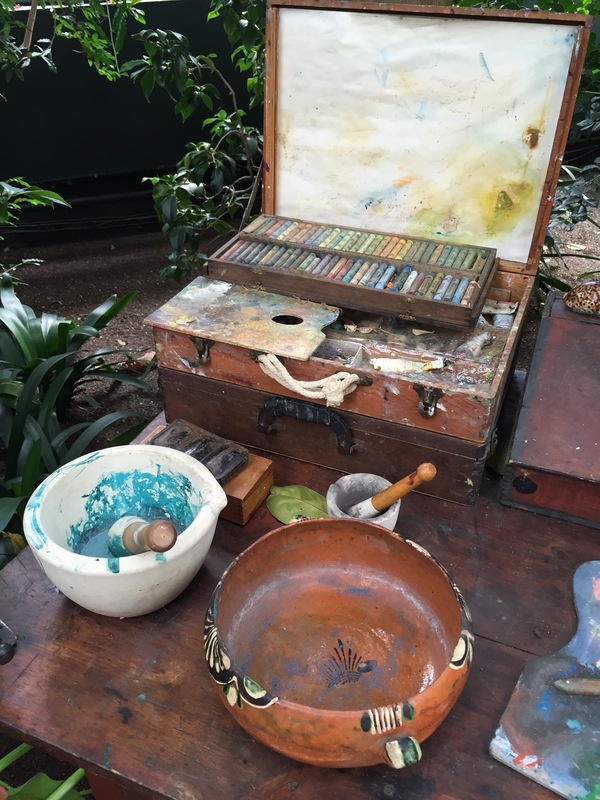 How did Mr. Auduon’s studio work compare to the real thing? See for yourself in this bird-watching documentary shown inside the gallery. The birds featured are from the previous installation of the exhibit, including the rare, rambunctious Prairie Chicken at 1:25. For more, go to the show’s excellent website, explore some of JJA’s works in more depth, and listen to the bird calls for the exhibition, courtesy of the Cornell Lab of Ornithology. 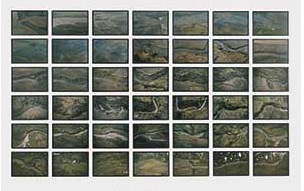 Katrín Sigurðardóttir, Haul IV (2004) travelling landscape-in-a-box on loan from private collector. Courtesy: The artist. When the weather dips below freezing and people think they’re in the Arctic, there’s no better place to get out of the elements and meditate on the landscapes of long, dark winters than the third floor of Scandinavia House on Park Avenue. Until tomorrow, January 10, you’ll join eleven contemporary artists from the sub-arctic on their journeys in a show mounted by the Katonah Museum of Art, Iceland Artists Respond to Place. Bjork may get all the media attention, but do yourself a favor and walk through this three-gallery show, which beautifully and simply presents the work of Iceland’s other leading visual artists. See the land of fire and ice through their eyes. Olafur Eliasson takes you on an aerial journey along a 60-mile meltwater river, from the mouth to the source. Ragna Róbertsdóttir splatters miniscule lava rocks against a wall but it’s not what it sounds like. Far from a violent eruption, it’s an undulating, mesmerizing meditation that you’ll spend time contemplating. For sheer romantic and modernist punch, enjoy Georg Guðni Hauksson’s two works – a large landscape memory and a solid dark blue canvas evoking the long winter nights (like an emotional Ad Reinhardt). Lava rocks “talk” in Egill Sæbjörnsson’s Pleasure Stones installation (2008) on loan from private collector. Courtesy: The artist. 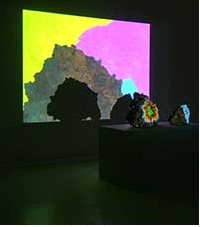 Egill Saebjornsson takes home the whimsy award with a multimedia installation in which rocks speak (seriously!). Eggert Pétursson zeros in the microscopic natural phenomenon – painting flowers (life sized) in patterns that read like tapestries. You’ll wish you were on some hikes with him. 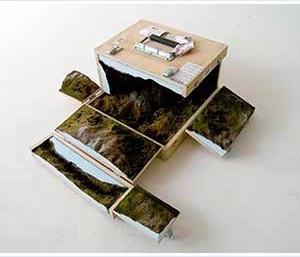 Katrín Sigurðardóttir simply packs up her landscapes into boxes. Tiny, tiny recreations of vast, romantic landscapes. When we visited the galleries this week, visitors were asking if there was more they could see. Scandinavia House always hosts classy, elegant shows, so although the exhibition space is limited, we have to admit they always leave us wanting to see what’s next from that part of the world.